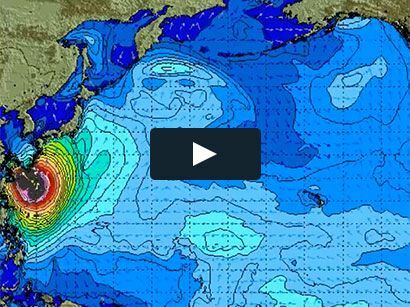 Surf News Network, November, 2016 – La Niña conditions were observed during October, with negative sea surface temperature (SST) anomalies in early November stretching across most of the eastern and central equatorial Pacific Ocean. With the exception of the Niño1+2 region, the Niño region indices remained negative over the last month, with the latest weekly value of the Niño-3.4 index at -0.8°C. The upper-ocean heat content also remained below average during October, reflecting below-average temperatures at depth. Convection was suppressed over the central tropical Pacific and enhanced over Indonesia. 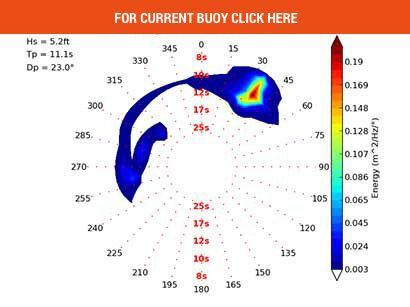 The lower-level easterly winds were weakly enhanced near and west of the International Date Line, and anomalously westerly upper-level winds were mainly west of the International Date Line. Overall, the ocean and atmosphere system reflected weak La Niña conditions. The multi-model averages favor La Niña conditions (3-month average Niño-3.4 index less than or equal to -0.5°C) continuing through the winter and given the current atmospheric and oceanic conditions, along with model forecasts, the forecaster consensus favors the continuation of weak La Niña conditions through December-February (DJF) 2016-17. At this time, the consensus favors La Niña to be short-lived, with ENSO-neutral favored beyond DJF. 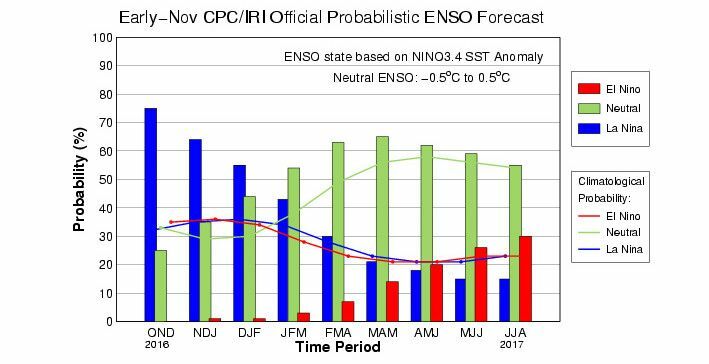 La Niña conditions are present and slightly favored to persist (~55% chance) through winter 2016-17 (click CPC/IRI consensus forecast for the chance of each outcome for each 3-month period). La Niña is likely to affect temperature and precipitation across the United States during the upcoming months (the 3-month seasonal outlook will be updated on Thursday November 17th). Seasonal outlooks generally favor above-average temperatures and below-median precipitation across the southern tier of the United States, and below-average temperatures and above-median precipitation in the northern tier of the United States. Forecasts are also updated monthly in the Forecast Forum of CPC’s Climate Diagnostics Bulletin. Additional perspectives and analysis are also available in an ENSO blog. The next ENSO Diagnostics Discussion is scheduled for 08 December 2016.